The EFHR goes to Mykolas Romeris University for promoting Minority SafePack. On 22 February 2018 the EVS volunteer Carmen Cara Lorente and the trainee Gabrielius Emilis Graželis went to Mykolas Romeris University for promoting the initiative Minority SafePack. They spent this day encouraging students to sing this petition and to inform them about it. 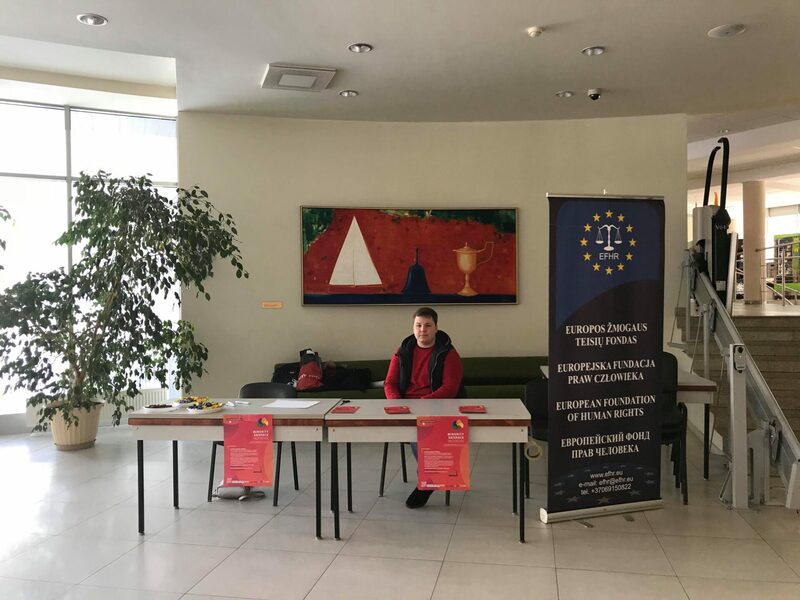 While signing this petition, students of Mykolas Romeris University have also a chance of winning a trip to Tallin, Estonia, as they automatically participate in a raffle that the European Foundation of Human Rights (EFHR) is carrying out. Another task they performed was to hand posters and flyers to students for a better promotion of this petition. The EFHR is leading the Minority SafePack campaign in Lithuania performing different types of activities across the country. One of these activities is to go to several institutions across Vilnius and to promote the Minority SafePack petititon, like in Byalistok University or at the Polish House of Culture. The efforts of the EFHR for promoting this important initiative have been officially recognised by several international institutions like the Federal Union of European Nationalities (FUEN) or the Embassy of Lithuania to Ireland.